And now its watch is at an end (it being season 3)! Good show, D&D! I know there haven’t been many seasons, but this was by far the best. That said, it’s understandable if as a viewer you felt this finale was a little anticlimactic after last week’s showstopper. 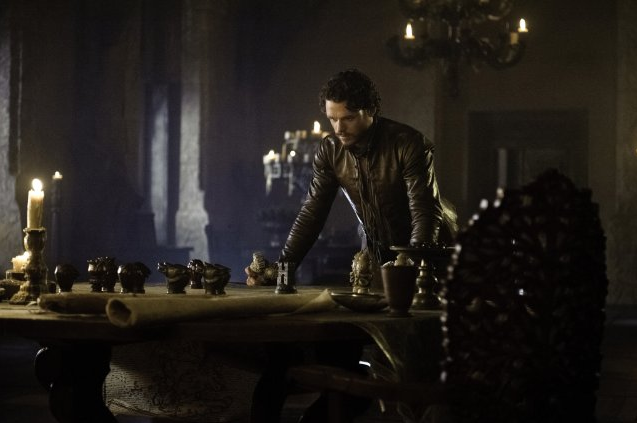 There’s absolutely no event that could top the horror of the Red Wedding (well, except for the event that many thought would happen last night that didn’t. If you don’t know what I’m talking about, you’ll have to wait till next season [or read A Storm of Swords]). Instead of trying to do that, they tried to tie up as many story lines as possible and set the table for next season, and I thought they did a good job. But there was also some fantastic stuff in this episode that it’s easy to forget about upon reflection. Certainly at the top of my list was the Small Council scene. Tywin Lannister is, as you know, my favorite Song of Ice and Fire character, and you can’t ask for more than Joffrey being Joffrey and Tywin being Tywin at the same time. There’s rarely more electricity in the room than when someone publicly threatens Tywin Lannister. What genius! At the various premiere events I’ve been to, I have yet to run into either Charles Dance or Jack Gleeson, but I’d love to shake both of their hands. The quality they bring to their work and the life they’ve imbued in their characters is, for me, one of the highlights of the show. Game of Thrones is filled with twists, action and some great special effects, yes, but for me some of the most fun I have watching the show is witnessing the verbal repartée between characters with massive egos—one of the same reasons I enjoy watching Downton Abbey so much, in fact. Since we’re in King’s Landing, I also wanted to tip my cap to Lena Headey. Cersei is an extremely unsympathetic character if you read the books. Some of the things she does have been left out of the show, but they’ve added some new scenes which really help to round Cersei out—and one of them came in “Mhysa”. I thought it was a lovely scene with her and Tyrion, and it adds a little something extra to this whole Joffrey question (i.e. how does the worst person ever come to be the worst person ever? What went wrong?). Not even she is blind to how awful Joffrey is, and yet he is her son. Lena Headey does a good job conveying just how tough that is. Also I actually like that the reunion of Cersei and Jaime is a bit overshadowed and understated. It’s not a triumphant return, but also theirs is not the best relationship. It’d feel a little weird to be cheering that reunion like it’s Ross and Rachel (and before anyone comments, yes, I recognize that a good chunk of America was not cheering for that reunion [I was among them], but I don’t know how many would be familiar with Florentino and Fermina). I think the scene laid the groundwork for what’s going to become of their relationship rather well. Another book comment. I like that the scene with Davos was allowed to play out. In the book, as I recall, that’s one of those chapter enders that George R. R. Martin is fond of: Davos is being carried away to be executed, and to save himself he pulls out a slip of paper and begins to read. You don’t know what or why; you have to wait until it’s explained later. Bleh. I’m a busy man. I’ll take my answers now, thank you. As I’ve been watching this season with friends, I can say with confidence that Ramsey Bolton is a crowd favorite. He introduced acquitted himself quite well this season, what with his little horn and his sausage from this episode. That’s classic mirth-making. Ditto to Arya and the Hound. I hope we get a few more good scenes out of that pairing next season. Before getting to the scene in Yunkai, I’d also like to mention a point of discussion that came up in regard to the “Wolf King” bit. This is something from the books, but we all found it to be quite a bit more awful than we were imagining—and I think this reaction has been a common one on the net. I think one thing that’s surprising is both my friend and I had the exact same reaction, which is that we thought the wolf head thing would be a lot cleaner than it actually was—but, realistically, there’s no reason it should have been. It should have been shoddy work, and, indeed, the wolf head should have looked like it didn’t fit on their properly. Still, when we read and imagined the season, we somehow imagined precision tailoring: a perfect fit for the wolf head, neat stitching… It’s comical, if you think about it, how unrealistic that expectation was. My friend contends this is on account of the fact that unless something is described in vivid detail (in the books it’s just an anecdote related by Salladhor Saan), our imaginations probably aren’t going to try to shock or horrify us. After all, such a thing isn’t pleasant. Thus, we get the Nutcracker Mouse King version of Robb with a wolf head in our imagination. Bizy sa Daenerys Targarien, Jelmazmo, Dorzalty, Dāria Sikudo Dārȳti Vestero, Muña Zaldrizoti. Sa va zer sko enkat jiva derve. The astute reader will note that this isn’t actually pure Low Valyrian, but rather a mix. Dany’s name and titles are done in High Valyrian, and everything else is done in Low. This was intentional. Dāervose jevosy yne enkot daor. Jemot ziry tepagon koston daor. Dāerves jevys tepagon yne sytilībos daor. Jemēle mērī sytilības. Lo ziry arlī jaelāt, jemēlo syt ziry mazemagon jemo bēvilza. Tolvies jemys. If there’s a controversial bit in that translation, it’s the choice of verb and tense in lo ziry arlī jaelāt—i.e. “if it again you want”. There are a couple of ways I could’ve gone. One would be, for example, to use the verb emagon, “to have”, in the subjunctive. I felt that was too hypothetical. This translation I felt was more direct (i.e. using the indicative rather than the subjunctive and using the verb for “to want”), and I liked it better for the content. It was a choice, though, so feel free to skewer me in the comments. After that, Dany commands her dragons to fly with sōvētēs (all three of them—hence, the plural command), and she asks her Unsullied to let her pass by saying Ynot rebagon. I know you’re probably looking at that and you’re all like, “Whaaaaa…?” so let me explain. Permissive commands (“let me pass”, “let him speak”, “let my dragon roast him like Roseanne Barr”, etc.) are done differently from other commands. The verb in the imperative is actually gaomagon, but it’s pretty much never used. Instead what you have is gaomagon in the imperative preceded by a verb in the infinitive (the main verb of the sentence) preceded by an agent in the dative. Thus instead of it being something like, “Pass to me”, it’s “Let me pass”. Oh, and a note since folks have asked, the lyric in that final chant was based on the last speech Dany gives, but was altered for the choir. I don’t think you can necessarily recover any of the text at this point. I haven’t checked, though. I didn’t write it and wasn’t involved with it. Olvie hen embraro tolmiot nykēlot avy ivestragon issa. Nykēlo syt ūndon daor luo valzȳro ñoghossi ōressiks. Dārys issa vestris, se prūmio ñuho konir drējior issa. Ȳghāpī īlōn rāelza, kesrio syt lanta iksan, rūso zȳhosy gōvilirose zijo syt pyghas lue prūmie. Vīlībāzma ajomemēbza, yn aderī, mōrī, aōt māzīli se hēnkirī īlvi biarvī manaerili. So much news I have to give you from over the seas. I find myself held by the arms of a husband I never expected to have. They say he is a king and of my heart that is true. He holds us safe, for now I am two, with his child beneath the heart that beats for him. The war rages on, but soon, when it is all over, we shall come to you and celebrate together. Okay. The Valyrian’s all there, so those who are interested can work on it. For those who were interested in the letter specifically because of the theory that Talisa was a Lannister spy (if you’re unfamiliar with this theory, go here for a full breakdown), obviously you can now see that the letter reveals that, in fact, she was not—or, at the very least, that she was actually writing a letter to her mother. You might be able to say it was a code, but if you go back to the letter that Arya saw from a Lannister spy, that doesn’t make much sense, since Arya had no trouble (a) reading it (i.e. presumably it was in Common), and (b) judging its content. In reality, all the letter does is point up the fact that there really is no actual evidence for Talisa being a Lannister spy. That said, the original video was very clever (even though it misses some obvious things. Everyone from Essos has an accent? What about Varys? ), and I felt that revealing the contents of the letter right after episode 7 would have pretty much torpedoed the theory (though note that the author of the video says at the end that the theory was a joke. Others thought it quite plausible). Conspiracy theories are fun when they’re about television shows (Who shot Mr. Burns? Who killed Laura Palmer? Who is Number One? ), so it’s no fun to have someone with inside knowledge rain on everyone’s parade. Plus, if fans can have fun generating conspiracy theories, can’t I have fun teasing? I’m probably never going to get another chance! But, yeah, the Lannister spy theory would’ve been a tremendous break from canon, I think. And even though they’ve broken from canon before (and will again), there are certain lines that they can’t cross, and that’d be one of them. Plus, I’d expect much better of Tywin. Plant a random girl in Robb’s army of thousands and expect that not only will he run into her, but he’ll fall in love with her? There’s way too many variables in that plan for someone as awesome as Tywin. Anyway I guess that does it for season 3. The first season, Game of Thrones was just getting its feet, and the second was building an audience. This season, I thought, was superb, and I would not be surprised to see it garner some serious attention when the Golden Globes and Emmys roll around. I contributed to the first two seasons, but I’m really proud of the performances in this season. Wonderful, wonderful work. And, to close the chapter on this season, I’ve got two words, and two words only. Admittedly, even knowing what was coming, that was pretty harsh—even harsher than hearing it from Roy Dotrice. So well played, D&D! But leaving the bad, let’s get to the best part of the episode: the adonis Jacob Anderson fighting like a lajak. Dude is awesome. The only thing more I could’ve wanted from this episode is to see that scene continue. It was a little 1960s Batman, but I’ll take it. I was mightily entertained. That’s translated as “I trust him”. Same intent, really, so no big deal. I did, however, recommend strongly that he say “this one” instead of “I”. What I should have done is simply translated it how I wanted to and sent it to them (noted for the future). Perhaps they’re suggesting he’s in the process of developing some agency (clearly true), but I never took the use of “this one” as anything more than a linguistic pattern—just something that happens on account of the idiolect spoken by the Unsullied—or perhaps even just a way of showing deference. Of course if it was the latter, perhaps this is a way of unassimilating himself. There’s a thesis in here somewhere, I swear! Lo jention mirre nūmāzme ēza, iderenna qopsa verdagon issa. So, first, let me just comment on the writing here. I like the scene as it actually appears in the episode much better than what’s written. First, Jorah wouldn’t actually have that much of a footprint on this scene if he didn’t have the line that was originally in Valyrian (i.e. “You command the Unsullied. What do you think?”). It also changes the dynamic a bit. Jorah’s going to Grey Worm as an ally, more than anything else. Almost as if he’s a Vulcan, or something: Grey Worm can tell no lies. So if Grey Worm thinks the plan is a bad idea and Daario’s leading them into a trap, it must be true. I like that better than Dany asking him, so kudos there. Furthermore, I also like the idea of Jorah addressing him in English, and then Dany kind of coming back to him in Valyrian. It makes it look less like he’s suddenly learned to understand Common (even though the dialogue, as written in the show, would make it seem like he does. How else could he understand the plan well enough to comment? All Daario was doing was pointing at a map—and that only slightly). Second, I also like the change to Dany’s lines. The lines as written are much more didactic—like Dany’s teaching him how to be an individual. As it’s written, it’s more like Dany is simply acknowledging his agency and giving Grey Worm the opportunity to step up and be a part of the conversation. The result is an exchange that’s less paternal (or maternal) and more empowering, in my opinion. Of course, I could easily have translated the actual lines if they’d asked (seriously, what else do I do? Translating for Game of Thrones is cake! It’s a treat I give myself after a long day of doing hard work on Defiance). They didn’t. Perhaps they thought there wouldn’t be enough time or I was too busy. Whatever it was, though, there’s no match between the lines and the subtitles. Even so, the direction of the scene didn’t change, so it’s not at all an implausible course of events (i.e. if you just read the subtitles or just listen to the Valyrian, it shouldn’t be a surprise what happens). Jentys Dovaogēdyro syt iksā. Skoros otāpā? I know there’s not a lot of Valyrian in this episode, but perhaps it’ll help to fill in some holes. Also, to return to an earlier topic, I was waiting for this episode to air to say anything about Talisa’s letter. The point is, I think, now moot, but I believe the subject deserves its own post. So bear with me; it’s late and I have to be on my game tomorrow. I’ll put up Talisa’s letter soon (perhaps before the post accompanying the last episode of the season). Didn’t I tell y’all there would be some Dothraki this season? Ta da! There it is! If I may come to things out of order, I thought the VFX of the White Walker dying were outstanding. Must be pretty satisfying to stab something and then have it turn to ice, fall and shatter that way. Pretty cool! Of course, Sam should’ve retained his knife (what was he so afraid of? He killed it! No way you can come back from that! ), but the action north of the wall has been replete with horror movie tropes, so it is fitting. For those who remember the specific action of the book better than I do, though, what was up with those birds?! I don’t remember that from the book. And why would they have been so excited about this encounter as to opposed to the others that we’ve seen in the series already? There were no crows in those scenes (or, at least, no literal crows). Oh, and one more question: Isn’t it a bit of a coincidence that that White Walker is the exact same White Walker we saw in the season 2 finale? I thought the scenes surrounding and during Tyrion and Sansa’s wedding were done very well. Reading those scenes initially, it was so frustrating how much Tyrion wants to convey to Sansa that he’s not a bad guy, and how miserably he fails to do so. I thought they captured that aspect of the books quite well in the scenes we saw here. There has been a bit of controversy in some corners regarding the scenes on Dragonstone. I would like to go on record saying I thought they were fine. I have no complaints, and found everything to be in keeping with what ought to have been expected. In today’s scene from Slaver’s Bay, we’re introduced to Daario Naharis, who looks nothing like I thought he would. You know who does look cool, though: Prendahl na Ghezn (played by Ramon Tikaram). Dude looks awesome! He’s even got the blue hair! (If there was any glare on your screen, you might not have noticed it, but his hair was dyed blue, I can assure you.) Alas, his role is a bit short-lived… It’s too bad. Honestly, I hope I see more of him in some other feature. He looks like a leading man, to me. Nya dare, beza unehtelas jaa engo ozy? And for those keeping track, yes, that is a Dothraki-style hiatus there with jaa, in addition to Dothraki-style post-vocalic h in unehtelas, both of which he nails, because Jacob Anderson is a Golden God. Bisi vali īlvyz zentyssy issi. The word vali was cut due to length, I’m guessing, but the result would still be grammatical (it would just mean “These ones [probably animate] are our guests”). If the form of the possessive adjective looks odd to you, then you’re really keyed in to the phonology of High Valyrian. 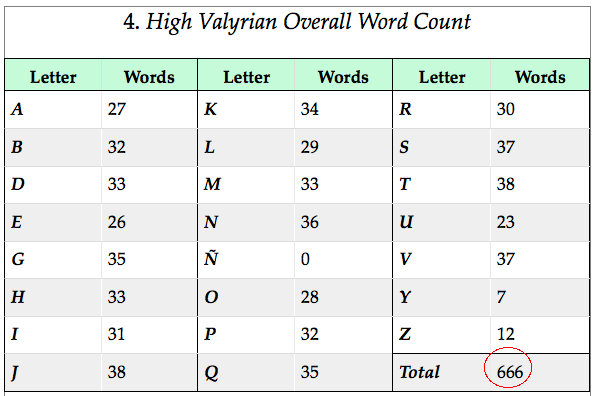 As I mentioned somewhere at some point in time, adjectives in High Valyrian have a different form depending on whether they come before or after the noun they modify. In this case, the full form would be īlvyzy. The final y drops out if the adjective precedes the noun it modifies, though, and the z devoices unless the next word begins with a voiced sound. Since “guests” is zentyssy, then, the form of the adjective is īlvyz and not īlvys. Zhey Drogo ast me-Dothraki thasho h’anhaan ven anha ray yol mehas. Me azh maan atjakhar. Those who know Dothraki will note that this line features the (somewhat) rare invocative use of zhey (i.e. bringing to the listener’s attention a person who hasn’t yet appeared as a topic of discussion). You’ll also note that athjahakar is misspelled. Indeed, this little exchange was supposed to reveal that Dany was never as good at Dothraki as she is, of course, with High Valyrian or Common. And the specific word is a call-back to episode 103, I think it was, where Dany’s handmaiden Jiqui (or Zhikwi) Irri is shown teaching Dany Dothraki by teaching her to say the word athjahakar. Looking at the above Dothraki line, you’ll note that Dany mangles it pretty badly. That was the intention, but personally I think Emilia went a little too far. Neither Dany nor Emilia was ever that bad! Of course, if Dany hasn’t really been speaking Dothraki much, I can see her getting out of practice (perhaps Jorah is the only one that speaks to the Dothraki now [or, actually, now Missandei can too]). She puts together a rather grammatically complex sentence, though. Pretty impressive for a second language learner! Oh, also I wanted to mention that the word for “son” from our title comes from Twitter user @Tracee2ez, who was my 3,000th Twitter follower! The word is trēsy, which is nicely symmetrical with the word for “daughter”, which is tala. Both are lunar words, but tala is first declension, and trēsy second. There are a number of dualities that work this way, where two words which are intended to be in some sort of semantic relation to one another differ either solely in declension class or gender, but in systematic (or semi-systematic) ways. This word, then, turned out to be quite the fortuitous coining, since I already had the word for “daughter”. Also, for those in the Bay Area, I will be at BayCon this Sunday. If you’re in the area, stop by and say M’ath! Oh, and one more also (consider this a public service announcement): The penultimate episode of this season of Game of Thrones will not be airing a week from yesterday! I guess due to a ratings slump on Memorial Day, HBO is skipping a week, and episode 309 will air on June 2nd. Perhaps I can put together a post next week trying to answer some questions. Or I can take a break and enjoy the weekend. We’ll see. Yesterday was George R. R. Martin’s episode for season 3 of Game of Thrones. Many wondered if Martin would write the episode from season 3 (if you don’t know which that is, you will by the end of the season), and in case you didn’t find the information elsewhere, he specifically did not want to. He said it was tough to write once, and he didn’t want to go through that again. There was quite a bit of character development this episode, which was important, but which, I gather from the internet, might have seemed not as exciting to some. Not every episode can have wall-to-wall action (though I would note that the dragons were quite entertaining this episode! ), but I really liked some of the conversations and developments from this episode. For example, a short scene, but the conversation between Sansa and Margaery was great (“Yes, dear. My mother taught me.” Rolling). Tywin’s little lecture to Joffrey was priceless, of course. It was also nice to see some vulnerability and passion from Melisandre (something we see in the books, albeit later on). I would also like to draw a comparison that I don’t believe anyone else has ever drawn. In fact, if someone has drawn this comparison already and you can show me the link, I’ll coin a word for you in either Dothraki or High Valyrian (depending on what makes the most sense). Ready for this? Here it is. The rise and fall of Theon Greyjoy (and what will eventually become of that once we get into his book 5 arc) reminds me a lot of Willie Loomis from the original Dark Shadows. The parallels are many. Not that I think George Martin was inspired by the character (they’re not that much alike in the particulars), I just find it to be a fitting comparison. If you have Netflix, I recommend giving the series a try. It’s way over the top, and the effects are terrible. It’s delicious. There wasn’t a whole lot of Valyrian in this episode, but there was some. It first comes up with Robb and Talisa. Talisa’s writing a letter to her mother and Robb asks her if it’s in Valyrian. There she replies with something I didn’t write, and which Robb repeats as ga (sounded to me like she actually says dha. Anyway have good ears?). I didn’t actually intend for there to be a simple word for “yes” in High Valyrian, but of course there ought to be in Volantene. So whatever it was that was said, let’s say that’s it. Later she says “hello” in Valyrian: rytsas. Robb is then supposed to mispronounce it, but he actually mispronounced it better than I intended (I intended ristas). The vowel change, though, probably sounds amusing enough. Regarding the letter, the text of it was written by Cat Taylor (Dave and Dan’s assistant) and translated by me. The shot of it is quite pretty; the art department did an awesome job! Ideally it should be in Valyrian glyphs, but I guess it didn’t seem worthwhile to create an entire writing system for what ultimately is kind of a throwaway shot. Though I do have the text of it (in both English and High Valyrian, which is what it’s written in), I don’t think I should put it up right now. I’ll put it up when the season’s done with, but there’s been a lot of creativity amongst fans regarding Talisa, and so I think this should remain a mystery for the time being. It isn’t gibberish, though, I can assure you. Later in Yunkai we get some more Valyrian from Dany, but none from conlang demigod Jacob Anderson! When I was first doing the scripts, it was like, “Yeah, whatever.” Now, though! They should have him narrate the entire series in Valyrian! What a linguistic adonis! Va oktio remȳti vale jikās. Belmurtī ivestrās kesīr pōnte jiōrinna se pōjon obūljarion mazōrīnna. Lodaor hēnkos vējose hae Astaprot Yunkai botilza. And that actually does it. I don’t know how much of that he actually gets through (I made it extra long so it would sound like he was trailing off and saying more). That’s Astapori Valyrian, in case you’re wondering; I didn’t have time to do a complete treatment of Yunkish Valyrian just for this line. There’s at least one word in there that could be unique to Yunkai, though. Also, an important note for regular commenters on this blog. A couple days ago something happened (unfortunately, I still don’t know what) that resulted in one of my blog posts being deleted along with all its comments—plus a dozen or so others. It wasn’t a post I was editing or working on, nor was it the most recent post. The comments, though, were recent comments. I worked with someone to restore an earlier version of the database, and the post is back, along with most of its comments. There are still a number of comments that aren’t back, though. We are working to restore them exactly as they were. Even if that doesn’t work, though, I do have a record of every comment, so at the very least I will be able to restore them myself (likely under my own login, but I’ll give the appropriate credit along with the original post date). I apologize for the mishap—especially since some of the best material on this blog has been in the recent batch of comments. I’d love to say that it won’t happen again, but since I don’t know what caused it and failed to replicate the problem, I just don’t know if I can say that. At the very least, I now know I can restore the blog, and that it appears to be backed up regularly. Welcome to the late edition of the Dothraki blog! Today’s post is late because I was away in Austin, Texas for the Fifth Language Creation Conference. I did see this week’s episode of Game of Thrones over there, but I saw it on Monday shortly before my flight home and didn’t have time to get a post up until now. Elsewhere, I really did enjoy both climbs (i.e. the climb up the wall and Littlefinger’s “climb” speech) and was amused by the awkwardness of Loras and Sansa. As a book reader, I am also genuinely curious just how Theon’s storyline is going to work. If this season is only half of book 3, and this part of the storyline comes from book 5, with absolutely nothing in between… I mean, how long can they (and he) keep this up? And, as promised (finally, since I never seem to be able to remember what order things happen in), we had some High Valyrian being spoken by different characters! This time we got to see Carice Van Houten and Paul Kaye take to it, and they did a pretty darn good job, I must admit! They had a grand little priest-off there, and I loved how the High Valyrian was sprinkled in. Language-wise, a very well-written set of scenes. First, Arya spies Melisandre’s party in the forest, and after initial greetings, Melisandre and Thoros greet each other with the traditional greeting which we know well. By the way, though, to my ear, Carice Van Houten did speak High Valyrian with a bit of a Dutch accent, I didn’t actually hear a velar fricative in morghūlis—surprising, given that you can’t get through “good morning” without pronouncing three of them in Dutch! Olvī voktī Rulloro Qelbriā ūndessun daor. Here I had to make a choice. I’d always assumed that R’hllor came either from Asshai’i or from some other language way out east. As such, I figured the word would be mangled in pretty much any common language it’s spoken in—including High Valyrian. But how to mangle it? High Valyrian is fine with geminates, and figuring that George R. R. Martin based this word on Arabic Allah, I decided to keep that in. But rather than dealing with the apostrophe and the h, I figured I’d do what I expected to happen anyway, if the name were pronounced in common, and just pretend like they weren’t there, inserting a vowel to make it pronounceable. This is why R’hllor gets respelled in High Valyrian. I imagine that one could still spell it R’hllor and then just decline the end of the word, but for the sake of the actors, I thought I’d use the respelled version. A couple of other things worth noting here. Voktī (citation form: voktys) is translated as “priestesses”, but just as with the word for “prince”, the word is epicene, and may refer to either a priest or a priestess. I’d also like to take a minute to discuss q. The voiceless uvular stop makes an appearance in both High Valyrian and Dothraki, but its status in High Valyrian differs from that of Dothraki. In Dothraki, it’s an honest-to-goodness phoneme, and for the native Dothraki-speaking characters, I expected (or hoped) they would pronounce it correctly (obviously not so for the foreign characters [e.g. Dany and Jorah]). In High Valyrian, though, I didn’t—and, in fact, outside of Kraznys’s and Missandei’s lines, I didn’t even pronounce the q when recording the lines (substituting k instead). That said, it was very important to me that q be different. In fact, when I talked about creating Valyrian with Dan and Dave, I asked them two—and only two—questions: (1) Just how different did they want Kraznys’s dialogue to be from High Valyrian, and (2) how did they pronounce valonqar: valon-K-ar or valon-KW-ar? The answer was vitally important and would have far-reaching consequences for the phonology of High Valyrian and its descendants. Frankly, I was delighted to hear they were going with valon-K-ar. So why is it so important if, essentially, it’s just a different k (which is what it is for all but the Astapori speakers)? Because of the potential it holds for the future descendants of Valyrian. With two different back consonants, it’s possible to have a sound change that affects one that doesn’t affect the other in certain environments. English speakers should be well familiar with the phenomenon because of the letter “c” ([k] in “car”, “crown”, “cough” and “cut”, but [s] in “cent” and “cilia”). Additionally, it meant that Valyrian didn’t have to be glutted with [kw] sounds (and also probably [gw] and even [ɣw])—a prospect I wasn’t looking forward to. Anyway, this comes up because of the word Qelbriā (citation form: Qelbria). It’s a modern (perhaps spur-of-the-moment) neologism from High Valyrian qelbar, which means “river”. Hence, the Riverlands are Qelbria. How pretty… I want to hit it like a piñata. I was curious how “Thoros” would be pronounced. If I didn’t mishear, she pronounced it “Toros”, yes? That would be the traditional High Valyrian pronunciation. Voktys Eglie aōt gaomilaksir teptas: Roberti Dāri zȳhi nekēpti se Āeksiot Ōño jemagon. Skorion massitas? Aōle rūda, nūmāzma issa. Quptyssy pōntālī johegzi se jomōzū. Aōhoso ziry rijībia, se ñuhoso ziry rijībin. Quptenkos Ēngoso ȳdrassis? If you’re glossing, it might help to know that there is no reflex for the word “way” in that translation. By the way, as a general rule, I kind of expect those whose first language wasn’t English to do a better job with the created languages than native English speakers (mainly because, in general, this has been true). But Paul Kaye did admirable work! He didn’t cut any words, and it sounded pretty much like a drunkard speaking High Valyrian. Nice job, Paul! Kesys ondor avy sytilībus daor. Ondor emon daor. Āeksiot zȳhon vaoreznon jepin, se ziksoso udlissis. And that’s the Valyrian for episode 306. Who knows if these characters will be speaking Valyrian again, but hats off to both the wonderful Carice Van Houten and Paul Kaye! They were a short couple of scenes, but I greatly appreciate the work you put in. Kirimvose! Next week there’s a little bit of material. And now I’m left wondering if they left that line in… Guess we’ll all find out at the same time! Of course the million dollar question is: Just what does that participial phrase agree with…? “Kissed By Fire”, written by my old compatriot Bryan Cogman, was low on action (outside the first scene), but high on drama. There were some outstanding scenes, and nearly every major character made an appearance (no Bran, no Samwell, no Theon, no Joffrey, no Melisandre, but everyone else). We haven’t gotten to see that very often of late! This week’s episode featured not one, but two scenes where Tyrion is demolished by an elder—first by Lady Olenna, and then by my all-time favorite Ice and Fire character: Tywin Lannister. And though usually an episode will end with a twist or a bit of high drama, I liked that we close with Cersei, of all people, finally getting the dressing down she deserves from someone (namely [who else?] Tywin). The man is a beast! As a happily married man, I will refrain from commenting on any redheads that did or did not appear in this episode. Anyway, let us speak of language. Some major highlights and an oddity in this one. The scene across the Narrow Sea featured Barristan Selmy not so subtly disinviting Jorah Mormont to the Queen Daenerys party along with Daenerys having a discussion with the leaders of her new army. Yn dāeri vali sīr issi. Se dāeri vali pōntalo syt gaomoti iderēbzi. Jenti jevi jemēle iderēbilātās, qogrondo jevo hēdrȳ. Then comes a truly perplexing moment. As one of the Unsullied approaches, Dany asks him to remove his helmet. I distinctly remember being asked to translate this line. In fact, I have the words “remove” and “helmet” in there that I specifically translated for this line. It should have been something like Geltī aōhe nādīnās. What she says sounds like derēpti, which means…nothing. (If it had a different ending, it’d be some irrelevant form of the verb “to gather, collect”.) I’ve scoured my e-mail, and I can’t find any record of the request, or of my sending off the translation. I also can’t seem to find the translation in my files. And yet I did not create the words for “remove” and “helmet” just because. I created them specifically because I was asked for the translation of “remove your helmet” for this season. I’m absolutely mystified by the entire situation, and am chalking it up to gremlins. And so I’m going to leave it at that. Which, of course, was incorrect (it should have been aōhe), but I was working quickly. I received a response at 4:10 p.m. PST, and that was the last I had to do with. For whatever reason, it never made it to the screen. Now I’m sure it wasn’t the messenger’s fault (the person I was e-mailing with); I’m sure they passed on the .mp3 and translation like they’d always done in the past. No, I think I know who’s behind it—and if it is, this is a person that’s run afoul of me before. And if, indeed, it was that person, they should know that my memory is long. Very long. Hēzīr, brōza jevi jemēle iderēbilātās. Mentyri idañe jevi ivestrilātās keskydoso gaomagon. Gadbag aōhe qrīdrughās. Muñar aōt teptas lue brōzi, iā mirre tolie iderēbās. Avy hoskas lue brōzi. Then…this. Man alive! Who the hell is Jacob Anderson?! And I mean that in the best possible way. I mean, he may have messed up one vowel somewhere in this long, long speech, but if he did, I didn’t hear it. Jacob Anderson is now and forever afterwards my hero. If you didn’t get a chance to see this scene, watch it—by any means necessary. Seriously. This performance? Un. Be. LIEVABLE. I want to bake this guy a cake—or wash his car—whatever! I’ll drive him to the airport for the rest of his life for this performance. If I could, I’d have him do recordings for me, because I think he’s better than me. He may as well have created this language. I want him to teach me how to speak this language. I want to make this speech my ringtone—in fact, I’m tempted to record the audio straight off HBO GO and upload it here… But, no. I’ll be good. “Torgo Nudho” hokas bezy. Sa me broji beri. Ji broji ez bezo sene stas qimbroto. Kuny iles ji broji meles esko mazedhas derari va buzdar. Y Torgo Nudho sa ji broji ez bezy eji tovi Daenerys Jelmazmo ji teptas ji derve. Next week my post may be a day or two late, as I’ll be in Austin, Texas for the Fifth Language Creation Conference. If you live nearby, please come and visit! It’ll be a great event with a host of incredible conlangers both presenting and in attendance. Loads of fun. So, until Monday or Tuesday of next week, geros ilas! 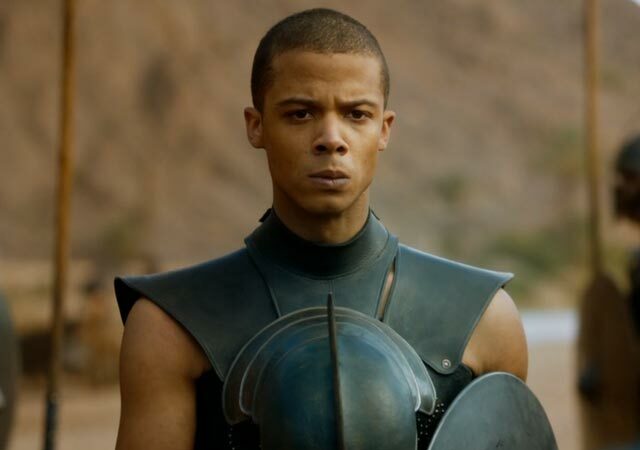 Update: And just in case you didn’t see it, here he is: Jacob Anderson as Grey Worm. My hero.